Stone house on the Mountain, Wadi Bih RAK, probably recently constructed. Visible from the main road. After almost a year of lethargic inactivity, yesterday I decided to explore the mountains of Ras Al Khaimah, where most of the off-road terrain still remain undisturbed by tourists and trekkers. The gently undulating Ophiolite mountains are dotted with the occasional guff (Prosopis cineraria) and Sayyal (Acacia tortillis). Evidence of ancient human settlement can still be glimpsed in the remaining cairns and tombstones. According to the Department of Antiquities, the period of human settlement must have been between BC 5000 to BC500. 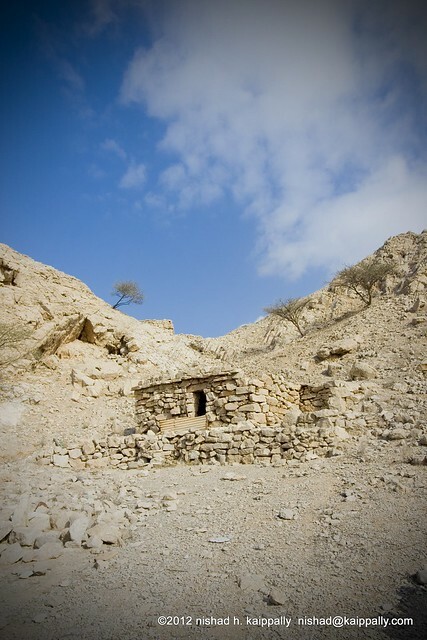 The closest location to see these stone structures is Wadi Bih, a short drive from Ras Al Khaimah heading East towards the UAE-Oman border. The interior of one of the stone huts. The Hajjar Mountain Range peaks in Musandam in Oman and extends south through the UAE back into Oman, forming a natural demarcation between Oman and UAE. This mountain has contributed a most essential resource in the massive construction boom in UAE. Every grain of sand for those skyscrapers and bridges and every rock dropped in the Gulf to form all those islands owe their existence to these majestic mountains. 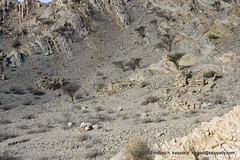 Having seen and photographed several ophiolite mountains in Oman and UAE I can appreciate the importance of this fundamental civil engineering resource which was skilfully employed by the early settlers to this region. 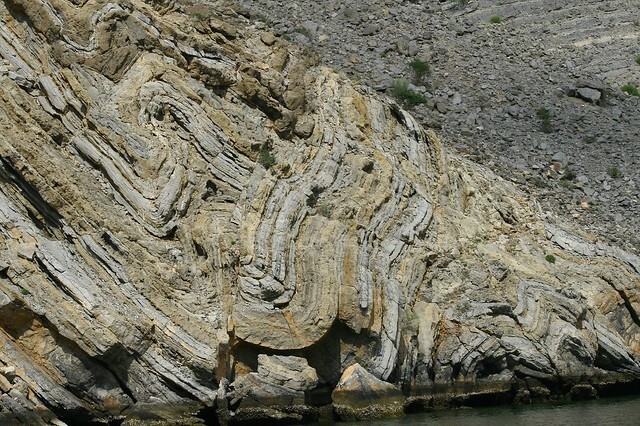 Periodic volcanic eruptions and subsequent ash fall-out over the cooling lava forms several sequential layers of deposits. 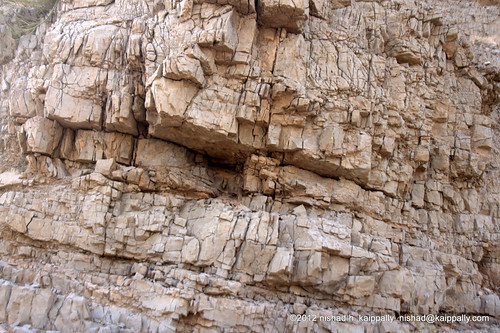 Seismic plate movements have pushed the Hajjar higher and formed these wrinkels in the rock. The layered outcrops have softer shale and soil deposits sandwiched between rock which forms natural straight cuts when cracked open. The stones used in building the cairn and cabins have these natural straight cuts that are of similar thickness. 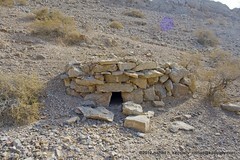 Several cairn can be seen along the road in Wadi Bih. 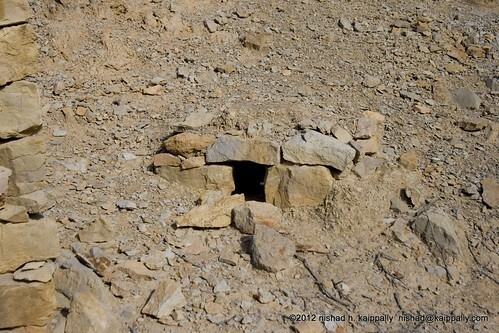 Although some of these appear to be constructed quite recently, there are still a few ancient ones deep in the valleys. There seems to be some agreement on the purpose of these structures among the locals who assert that these were constructed as winter homes. I did observe four large rectangular stone huts (approx 2.5m by 2m). All of them had lintels over the doorway to support a roof. Remains of long broken stone (beams?) were seen inside the hut, suggesting a roof collapse. Although The larger structures do appear to be stone cabins, what fascinated me most was the smaller structures (1mX1m ) which seemed too small for any practical use. Identical in form and stone setting and lintels over the doorway. Small structure with lintel over the opening. The stone huts were overlooking a graveyard with about a few dozen graves. These settlements were clearly pre-islamic since many of these graves faced the West rather than towards Mecca. So it can be safely assumed that the smaller structures were not meant to be graves for the commoner. Perhaps these could be places to worship or abode for the spirits of the recently deceased. I could not find any excavation reports or studies conducted on these small structures, like those conducted on the more popular Hili and Shimal tombs. Wadi Bih is close to Ras Al Khaimah and poses the risk of being over-run by "development". It's fragile natural tranquillity may not remain undisturbed for long. Many stone quarries operate in Ras al Khaimah and several new roads are being constructed to quicken the pace of dismantling the mountains to make high-rise buildings in the city. The abandoned villages and any remaining traces of ancient human settlements may be completely lost to future generations. 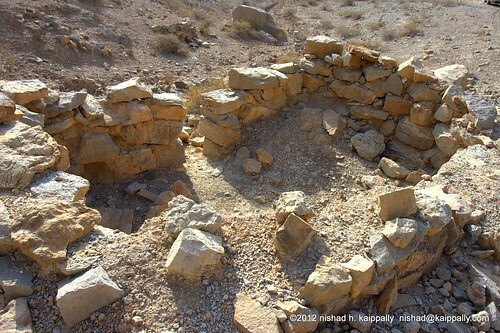 good info kaips..near to maleha road and upto kalba, there are many archeological excavations going on and recently much news have come up on finding pre-historic sites in and around uae. the empty quarters too are being widely excavated for archeological purposes.